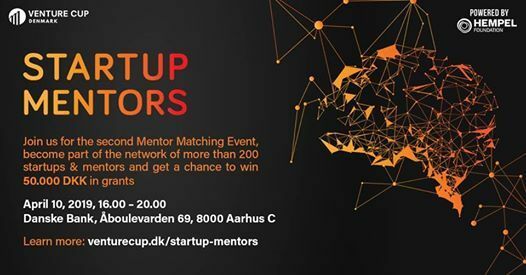 We have redesigned Startup Mentors to be more fun, engaging and valuable for our Venture Cup Denmark family! As a new initiative, startups and mentors will, from 2019, get more out of their involvement. It already proved to be a success as three weeks before our two Copenhagen events, the arrangements are sold out. We are excited to be present in Aarhus, too! For Startups: On top of the six months mentorship, startups who sign up for the Startup Mentors program, now also get access to more than 10 exclusive deals with our partners and a chance to win 2 x 50.000 DKK in grants. For Mentors: We have partnered up with the highly specialized KMP+ House of Mentoring in order to equip our mentors with some hands-on-tools on mentoring and a mentor guidebook, before they start their adventure with a university startup for the 6-month period. This event in Aarhus is the second one in a series of 6 annual events taking place in Copenhagen, Aarhus and Odense. Read more about the new concept here: https://venturecup.dk/startup-mentors/. 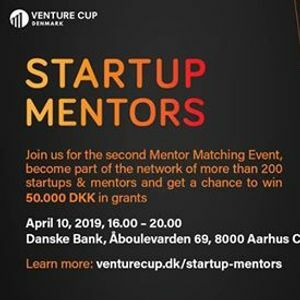 Sign up for the second Startup Mentors event in spring 2019 hosted in collaboration with our partner, Danske Bank. Special thanks to Hempel Foundation for their continuous support in boosting the entrepreneurial scene in Denmark.